The main parts of the A frame are made by Dragon which I have altered slightly, by using a page about the 'A' frame assembly as reference. The first thing I did as shown in Picture 1. was to repaint the cloth material of the frame itself, as I wanted to get away from the toy look it had. 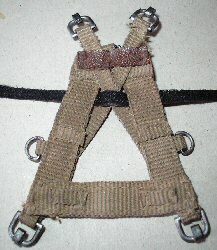 This I did by using some diluted Light Brown acrylic paint to re-colour it, I also repainted the clips that connect to the 'Y' strap. and I then gave the frame a drybrush with some Tamiya Light Sand weathering powder, to add some highlights to it. 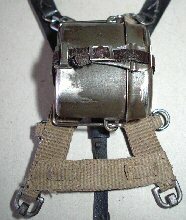 To attach the DiD mess tin to the frame in Picture 1. shown from the front, and Picture 2. from the back. 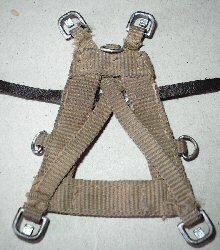 I have used a picture from the reference page Picture 3. to show the way that the strap is attached to the full size 'A' frame. On my 'A' frame I made some small slits between the two pieces of material, so that I could pass the mess tin strap through the frame to hold it in place the same way. In Picture 4. 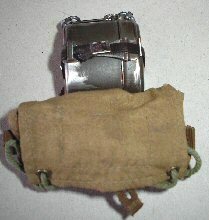 I have attached the mess tin to the 'A' frame, the bag for the A frame has also been altered by repainting it with some diluted Model Color 70873 US Field Drab acrylic paint as shown in Picture 5. 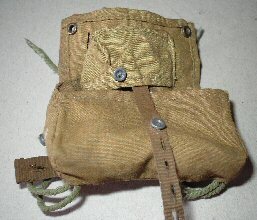 I left the pocket the original colour of the material, so it would be different to the rest of the bag. Picture 6. shows the back of the bag with the side and the centre inside straps painted with Model Color 70983 Flat Earth acrylic paint. 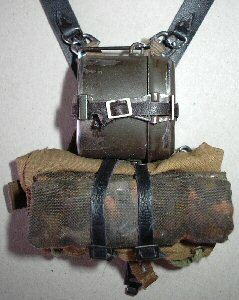 I also repainted the threads used to tie the bag together with some Tamiya XF-58 Olive Green acrylic paint. In Picture 7. 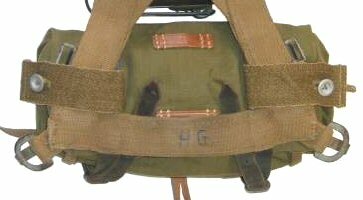 I have attached the bag to the 'A' frame just like it is shown in Picture 8. from my reference page. 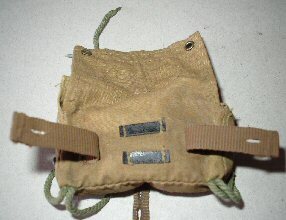 Picture 9. shows the bag from the front, the straps and the bag was then drybrushed with some more of the Light Sand weathering powder on to it to add highlights. I made the roll from a Dragon zeltbahn that I cut the middle part out of, so that I could have a roll like this which is more in scale. A bonus from doing this is that the material from the middle is in two pieces, so I had enough to make two rolls like this. 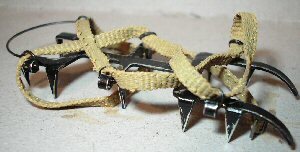 The weathering of the crampons was quite easy since they are made of metal, and for this in Picture 11. I just scraped along all of the edges with my model knife to remove the paint. 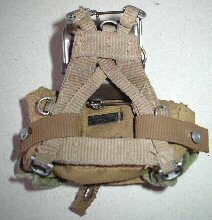 The straps were also repainted with some Model Color 873 US Field Drab acrylic paint. 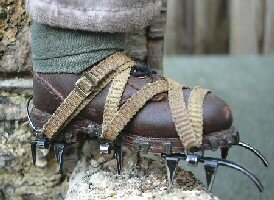 The fitting of the crampons onto the boots was at times a real trial for me, as I would have them almost ready to buckle up and the metal support at the back would come out. 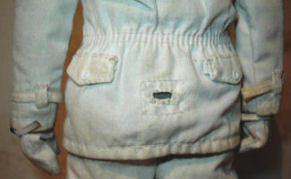 The tunic for the figure as shown below in picture 13. was made by Toys City with the trousers in picture 14. from Dragon, in Picture 15. I have a Dragon winter helmet cover and a pair of winter mittens. 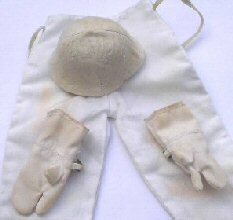 All of which have been placed on the top of another pair of white winter trousers to show the weathering I have made to the uniform. To add a start of a weathering effect I have tried the Coffee trick above as mentioned by Bob a Job. And I am impressed with how different the uniform looks now. As it has added an overall discoloured dirty effect to the uniform, and by rubbing with my fingers on it, I can choose which places to keep the dirty marks. Usually I do not bother to put a uniform under the winter clothing. 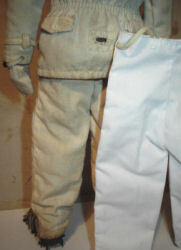 But for this figure I wanted to bulk out the material, so that the outer white uniform would crease up better. These pictures show how I have also added some extra weathering with some Mud powders on top of some Brown pastel chalks, the chalk was first added and rubbed in between my fingers on the bottom edges. I then went over the top of this the lighter Mud weathering powder, so that it highlighted the tops of the creases. Pictures 17. 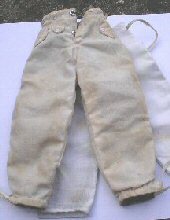 & 18. show a pair of brand new white trousers against the weathered uniform as a comparison. 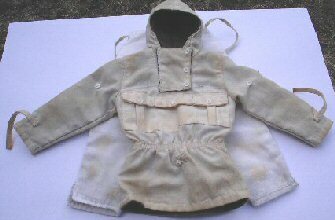 Note: Another page I have made about weathering uniforms is here - Weathered. 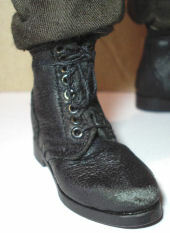 I have weathered these boots the same way as I have altered the other boots for my figures, Boot Changes, Toys City boots, DiD Boots and Jackboots Weathering. 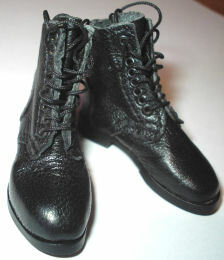 In Picture 19. below these are the new boots that I bought loose, as an experiment to see what they were like. And I must say that I do like them as they are of a very soft 'pleather type of material, close to the DiD boots and very similar to the Newline boots. 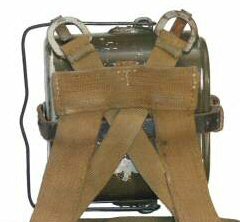 The only thing I must say I don't like is the thickness of the material at the front of the eyelets as shown in Picture 19. To lose the new shiny look to them, I decided in Picture 20. to repaint them with some Black artist's acrylic paint. 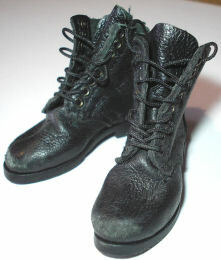 When that had dried I then folded up the boots to add some creases to them, as well as adding some scuff marks with sandpaper to the toe caps. I then gave the boots a drybrush in Picture 21. of some Tamiya Light Sand weathering powders, to add some highlights to the edges of the boots and laces. 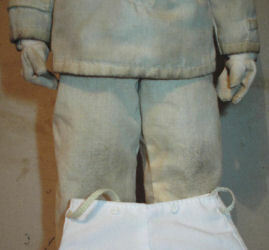 It also shows how the boots are on a figure, along with how I have bloused the trouser bottoms into the top of the boots. Many thanks to Tom from www.mp44.nl for his kind permission to use his pictures for reference.